My husband sometimes pokes fun at me because he suspects I may be an 80-year-old stuck in a 30-something’s body. On more than one occasion, I’ve planned dates to places where we were the youngest in the building by 40 years. So I question my judgement on things sometimes. Omaha dad Aaron checks out the butterfly pavilion at Omaha’s Henry Doorly Zoo & Aquarium. When it comes to this blog, I wonder if dads read it or find it helpful. In case I don’t “speak” to that male demographic, I’ve enlisted some Omaha dads to help me out. They provided a lot of ideas that suit all budgets and all ages. Also, and this is our most regular stop when the weather cooperates, we love hiking at Hitchcock Nature Center, about 20 minutes northeast of Omaha on the Iowa side of the river. One dad asked his 4-year-old daughter for her favorite daddy-daughter outing. 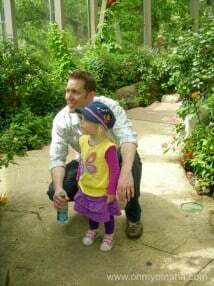 “Other than that, we have taken her to the children’s museum, Fontenelle Forest, the zoo and the Rose Theater a couple times, all of which I know she really enjoyed. And really not too expensive. 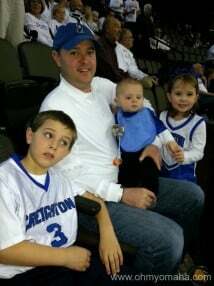 Rob with future Creighton sports stars. “We liked walking around the farmer’s market downtown last year. I love that you took this angle! It’s always interesting to me that my husband and I have very different ideas when it comes to what constitutes an “outing” with the girls. I think kids benefit from a variety of activities, so I guess everyone wins. Thanks for sharing! Thanks, Thea! I was curious to see what they all would come up with, and I knew I’d get some good ideas I could turn to when the kids get a little older. It’s fun to let the dads plan once in a while. Proves that the kids don’t really need anything over the top. Just some time with dad is a great thing! Great suggestions from all the dads. Isn’t that the truth? I love it when my husband plans things for us.